Pine Haven Christian Home was founded in 1950 to provide care for our seniors the way Christ would. Our Long Term Skilled Nursing Care features higher staffing levels than most nursing homes, allowing us to provide better care for every resident. Stop in and see our clean, inviting home and smiling staff and residents. What makes Pine Haven your home is the people. Each staff member and volunteer is driven by a commitment to provide the best care possible. We don’t just provide compassionate nursing care and assistance with the activities of daily life, our staff cares for you like family, so you can feel confident that your loved one is safe and secure, even when they are at their most vulnerable. Our Long Term Care has higher staffing levels than most care centers offer - allowing us to respond to our residents' needs promptly and compassionately. This higher staffing level allows our staff to get to know our residents very well, understanding each resident's preferences so that care can be customized for everyone. We recognize that this is our residents' home and understand that our care must adapt to their needs. That’s why we have adopted a “resident-centered” model of care. Staff work together to take care of the needs of every resident, ensuring the household functions as it should. We’ve empowered the staff to make decisions to better serve our residents. We are here because we want to serve - and we're dedicated to providing you with the care you need as Christ would. Our staff is nurturing and compassionate, going out of their way to do the little things that make our residents feel special - like painting nails, taking special care with dressing, jewelry, hair, and makeup, and simply spending time with residents. It's a different kind of atmosphere, and we love it so much that our staff tends to look at Pine Haven as our own second home - with many having served for more than 10 years. Stop in and take a look around. You'll see a clean, warm, inviting home, and the smiling faces of our staff, and our residents. 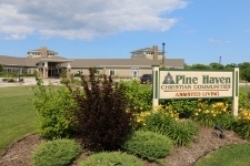 Pine Haven's Long Term Care includes 36 private rooms on our Haven Drive campus. Rooms have been designed to increase comfort, with intimate dining rooms and many family rooms so households feel like a true home. A brief, printable brochure about our Long-term Skilled Nursing Care can be downloaded here.